Analytics and statistics continue to amaze me. I love seeing how information graphics can change the way we look at raw data and how we can learn to change our behavior just by examining the simple facts if they are presented well. In 2017 I got an e-cargo bike and began to record all my rides using the bike odometer and google timeline. I tracked how far I peddled, how many rides per month I took and how many miles per year I rode. I complied the 2017 date here and I realized most of my trips around the city were under 10 miles and on an e-bike were faster, more enjoyable, and cleaner vs that of being stuck behind a wheel of a car. I spend more time with my then 4-year old daughter visiting parks, playground, museums, preschool drops offs and discovering new parts of the city. In the process, I saved money on my commute and got in better shape. For 2018, I continued to track just how I moved about the city. The Yuba Mundo cargo bike, 750w erad mid drive motor and 48v, 20Ah battery have just about paid for themselves after 2 years of continued use. The routine of taking my e-bike instead of the car was even more reinforced this year as I increased my bike usage and reduced my car dependency by almost 20% vs the previous year. The biggest difference between year one and two on the e-bike was how I used it to commute to Sausalito from San Francisco. At $7 a trip across the Golden Gate bridge, it was a no brainier. In 2107, I made the 18-mile commute 99 times- saving myself almost $700 in bridge tolls + $500 in deferred car related cost. For 2018, I made the commute 158 times on the e-bike saving over $1100 in tolls & $900 in car cost. The untracked costs were even more- increased exercise, less CO2 pollution and more time spend outdoors. It’s hard to put a direct price on those but I know I’m happier and healthier while commuting on the e-bike. Riding an e-cargo bike is still relatively low on the biking pecking order, just one rung above the recumbent low riders. Some say, riding an e-bike is even cheating. I have to scoff as I glide past the $10k carbon lycra- clad cyclists on the uphill grind. Often times, I look back and 2–3 road bikers will be riding in my tailwind, taking advantage of the windbreak of an upright 60 lb e-cargo bike with a 6 pack in the front basket and a casual dressed bike commuter. Despite the hierarchy, most bike manufacturers have delved into the e-bike market. It’s one of the biggest growth markets in the bike field from the e-bike commuter, e-mountain biker to e-cargo bike dad. While “enjoy the ride” has always been my mantra; “one less car” is not too far behind. The reasons why I ride a bike are many but one of the more important reasons is to make my city a better place. The reduction in traffic and pollution are obvious but creating places where safe streets are encouraged only comes with more people biking. I long for the days when I lived in Amsterdam and there was no bike subculture but a culture built around bikes where women, children and people of any age cycled on the same safe lanes without fear of being run over by a car. While I wish San Francisco and Sausalito had more dedicated and separated bike lanes, my commute is still relatively tame with painted lanes or sharrows along most of the route. Dropping into Sausalito from the Marin headlands can be downright scary in the summer months of mixed traffic, tourist and buses when the painted bike lane merges into a shared use road. I witnessed one accident this year while a road bike was passing a car as Alexander turns into Bridgeway on the downhill. It made me really slow down and simply be aware that we all share the road and responsibilities no matter who might have the right of way. Still however, there’s really no excuse for not having separated safe bikes lanes in a 21st century city. Despite the risks, biking is still relatively safe. I try to stick to the bike lanes when my daughter is on the bike but have still had some aggressive drivers question my existence and presence on the road. Often times, I’ll just pull over for 30 seconds to wait it out and get some separation from the agro drivers but more often than none just go around and be out of their way sooner than none. 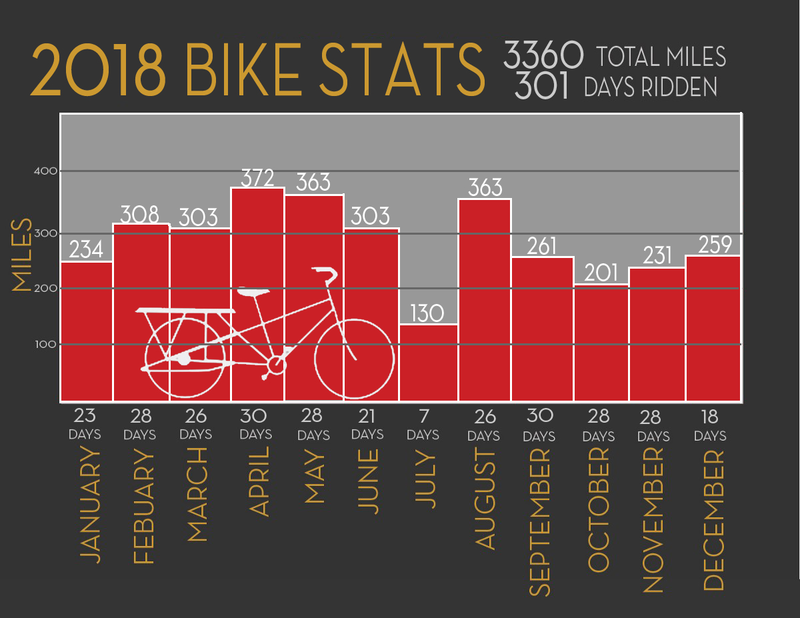 In 2018, I averaged 280 miles per month on the e-bike with 3360 miles total for the year. That was only a 4% increase from 2017 when I rode 3233 miles. More importantly, I was able to reduce my car miles in my car by 17% from 6500 miles in 2017 to 5409 in 2018. Out of those 5409 miles driven, just 3359 came from my own car while 2050 miles were on a rental car out of state and country. 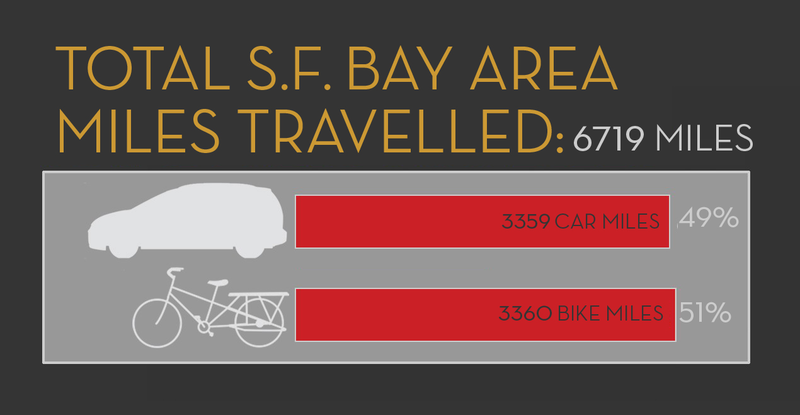 2018 was the first year, I biked more in SF Bay area than I drove in the car. If you would have asked me 3–4 years ago if this was possible, I would have laughed. Our culture is set up for cars. Roads are built for cars. Suburbs are built for cars. Parking lots are built for cars. In 2016, I drove like most others, putting around 8oo miles a month on my car while putting less than 250 miles on a bike a year. Something changed when I had a kid and I made a conscious decision to spend less time in the car. It was really only possible with the help of an e-cargo bike. The first year with the e-cargo bike, we zoomed up hills, explored parks, did pre-school drops offs, got groceries- all without a car. In 2018, I continued the trend, trying harder to make it an everyday affair. All those miles in the saddle pale in comparison to the 4 airline trips I took in 2018 totaling 25,000 miles and resulting in somewhere between 6–10 tons of C02 emissions, depending on how one calculates their C02 emmisions from domestic and international flights. This was the largest portion of my carbon footprint despite all my efforts of riding, reducing my dependency on the car & eating a vegetarian diet. The first step in reducing C02 pollution is to become as transparent as possible by becoming aware of our actions and their consequences. As I look towards 2019, I’ll begin to question both the big and little choices I can make to lighten my impact on the limited resources available. After all is said and done, a self examined life is really the only life worth living. What ever you peddle, always remember to always enjoy the ride. To follow the adventure even further, you can follow my twitter feed @usa4 where I chronicle my rides, golden gate sunsets and other on the water adventures.